I signed up for the Evans Cycles, West London Sportive ages ago in the knowledge that it would be the first biggish ride of 2017. The weather recently has been terrible and there was even the possibility of snow. The only snowflakes however were the whimpish types who bailed because rain was forecast. I set off for Osterley Park bright and early with my waterproofs and my Whyte mountain bike. 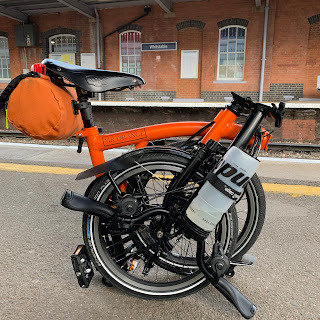 There was no way I wanted to take my Condor and I toyed with the idea of my Brompton but I have done this ride on a Brompton before, so decided to choose my mountain bike instead. I also figured that my mountain bike with its meaty tyres would handle all the rain, crud and potholes that bit better. More on that later. Arriving at Osterley Park I was struck yet again at how pretty it all looked. I was also struck at what a dump the surrounding area was and how this house only serves to magnify this. Registration was quick and easy as there didn't seem to be a huge amount of people around. The Evans staff were enthusiastic and friendly and with this over with I made my way to the start area. This was thoughtfully covered by a sort of tent with Evans Cycles livery. After a brief safety talk and instructions, the handlebar numbers with barcode were scanned out and we were off. I seemed to be the only person on a mountain bike - which was later confirmed at the halfway refreshment stop - everyone else being on a road bike. My group started with about 15 riders and I knew that I would not be able to keep up with them for long, me being on a mountain bike. This didn't bother me. I had downloaded the gpx route and stored it on my Garmin and was relying on it to tell me where to go along with the very helpful black on pink arrow signs Evans Cycles had marked the routes with. I had originally opted for the medium 52 mile route but as I was on my own and it was raining - for probably the entire ride - I decided to go for the short 42 mile one instead. About 20 minutes into the ride there was a steep winding decent with potholes, gravel and the like. I found that with the beefy tyres I could descend quicker than I would dare on my other bikes. A roadie in front of me cycled down too quickly with skinny slick tyres, skidded and was off into bushes. I stopped to see if he was okay and thankfully he was with nothing but pride dented. The rain was a constant companion but nothing too terrible and not getting heavy to the point of making proceedings uncomfortable. I have cycled in far worse over longer distances. One night ride to the coast to Brighton was like a monsoon for a constant seven hours! With 22 miles coming up the feed station came up and was a very welcome sight! There I was able to partake in some generously thick cuts of lemon drizzle cake and fill up my water bottle. This feed station was outside an Evans shop and one of the members of staff came out for a nose at the bikes that had stopped there. He liked my bike and confirmed that as far as he was aware I was the only participant using a mountain bike. Feeling suitably refreshed I headed out for the final 20 miles. I was enjoying this ride. The other participants were a friendly bunch and the odd mile here and there were spent chewing the fat about all sorts before I pedalled off. I continue to get on very well with my mountain bike. The ride was comfortable and on a day like today I welcomed the thick tyres and stopping power. The front forks with the suspension locked out make things that bit firmer for the road but still allowed lots of shock absorption when the road surface deteriorated. Reaching Osterley Park again was almost a surprise as having the Garmin displaying the route map I had not paid any attention to the millage. I went through the finish tent, handlebar number scanned and my ride was over. Thanking the Evans Cycles staff I took a few photos before heading back home. This was a lovely ride and I enjoyed it a great deal. It was a shame that the weather wasn't better and more of the old guard could have attended but it was nonetheless a great little ride. The 42 mile option seemed like a better fit today and it is great that Evans Cycles allows participants to swop the route they have originally signed up for - as long as you remember to tell them of course.